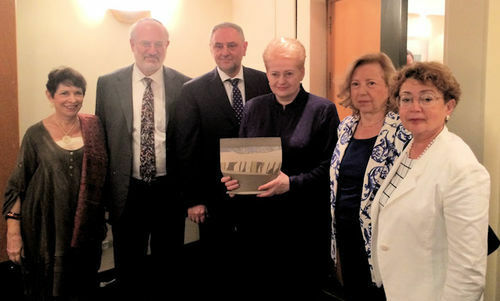 A delegation of the World Jewish Congress (WJC) and the Israel Council on Foreign Relations (ICFR) met with Lithuania’s President Dalia Grybauskaitė in Tel Aviv on Wednesday morning to discuss a number of issues. The meeting was also attended by the Baltic country's foreign minister, Linas Linkevičius. In recent years, Lithuania has tried to foster good relations with the World Jewish Congress Israel. In an address to a WJC-ICFR event last month, Lithuanian Prime Minister Algirdas Butkevicius pledged to ensure that all Jewish cemeteries in Lithuania would be “memorialized and marked” by the end of 2017. In 2014, the World Jewish Congress established the WJC International Yiddish Center in Vilnius aimed at promoting cultural treasures created in Yiddish and the continuity of Yiddish learning and research. Dalia Grybauskaitė took office as Lithuania’s head of state in 2009 and was re-elected in 2014. She previously served as a government minister and was Lithuania’s first European commissioner between 2004 and 2009.